Years earlier, in August 2002, victim family members publically announced a $1 trillion lawsuit against alleged Saudi bank rollers of Osama Bin Laden. This lawsuit has been stalled and defeated at every turn. In November 2002, the lawsuit became even bigger and costlier at $15 trillion dollars as more than three-dozen new defendants were added, including members of the Saudi Royal Family. Interestingly, three members of the Saudi royal family have since been given legal immunity from prosecution. Attorneys for the victims' families told the Staten Island Advance in 2006, that it could be "another several years before the lawsuit goes to trial. " In July of 2003 9/11 Commissioner Max Cleland was interviewed by Frank Sesno of PBS. In that interview, he stated: "You can read between the lines and see that there were foreign governments that were much more involved in the 9/11 attack than just supporting Islamic fundamentalist teachings and schools. Now, that has been redacted. A whole 28 page section." 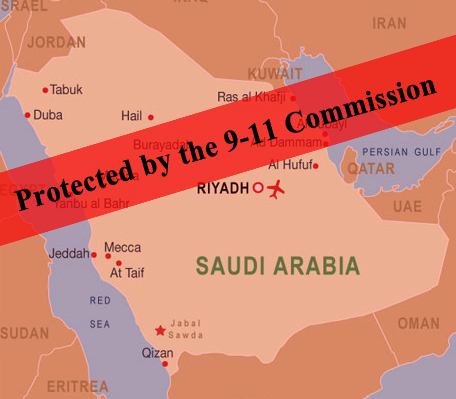 In September of 2004, a month after the official close of the 9/11 Commission, Senator Bob Graham accused the White House of covering-up the involvement of Saudi government officials in the 9/11 plot. Despite attempts by family members to get this information made public and promises from the Obama administration to do so, the redacted 28 pages of the Joint Intelligence Committee Inquiry into 9-11 remain secret and are likely to remain so. In May of 2010, Supreme Court nominee Elena Kagan refused to give the victims' families’ lawsuit a hearing. Her argument was that US foreign policy would be interfered with if the lawsuit was allowed to go ahead.